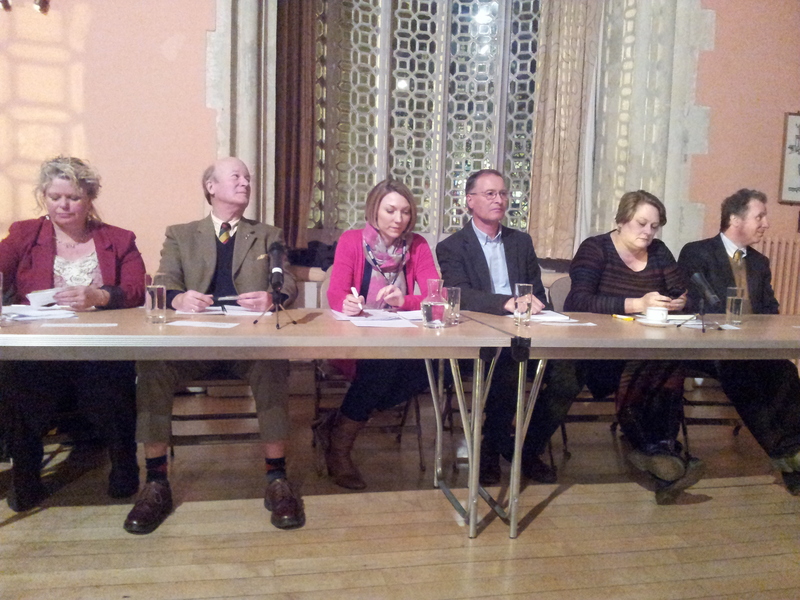 Getting reading for the Hustings – left to right: Ros Kayes (Lib/Dem), David Glossop (UKIP), Katie Martin (chair – BBC Radio Solent presenter), Peter Barton (Green), Rachel Rogers (Labour), Oliver Letwin (Conservative). On Friday 6 March WAND held a Question Time style event with parliamentary candidates for West Dorset to launch a week of activities and offers to celebrate International Women’s Day. The panel, which included Oliver Letwin MP (Conservative), Ros Kayes (Lib/Dem), Rachel Rogers (Labour), Peter Barton (Green) and David Glossop (UKIP) were asked 4 questions relating to women’s issues and how they proposed addressing them. Topics covered included improving safety for local women and tackling domestic violence, reducing the impact of austerity which has particularly adversely affected women, improving equality and representation for women in all walks of life, and safeguarding workers from exploitation through the use of zero hour contracts. The evening, which was held at the Town Hall in Dorchester, was very well attended and those who went said what an interesting an informative session it had been. Emma Scott, WAND member, said “ It was a very lively and animated evening and it was obvious that the people who came were very engaged with the political process and concerned to hear what the prospective candidates had to say. Many of the topics covered also relate to men and of course equality is an issue that both genders should be concerned with so it was good to see lots of men coming to the evening too. It was a great debate and a good way to really learn more about those that are seeking to represent us in Parliament. I would certainly encourage anyone who could not make it to this event to attend one of the other public hustings that are being organised in the run up to the election – details should appear on candidates websites”. WAND would like to thank all of the volunteers who helped run the debate and in particular Katie Martin, BBC Radio Solent’s afternoon show presenter, who chaired the discussion. Katie did a great job of making sure that we heard from all of the candidates and that they answered the questions posed fully. WAND will be ending the week with our flagship Dorset Women’s Day at the Dorford Centre in Dorchester. This event, which is free to attend, includes 25 different workshop sessions where women can learn a whole range of new skills from how to crochet to basic plumbing. For more information contact Emma Scott on 01305 252204 or pick up a programme at your local library, West Dorset Tourist Information Centre or at Waterstones in Dorchester. 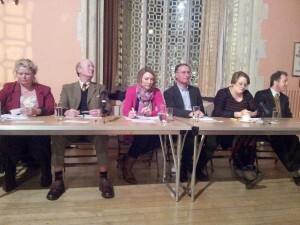 This entry was posted in Activity, Event and tagged Dorchester, Dorset, Hustings, women, Women's Day on March 9, 2015 by mariac. What a terrific event it was – well done for getting it organised guys, it certainly helped me to firm up and confirm my own political opinions.